Last weekend, more than 230 of our closest friends gathered at the place we love most to celebrate seventy great years of life-changing ministry at Lakeshore, and what a blessing it was to be together. On Friday night, we welcomed old friends and new, embraced new Lakeshore babies and children and caught up with everyone as they breathed that sigh of peace and relief for being back home. We gathered for worship in the Tabernacle where Bishop Mcalilly prayed a blessing over the Holy Ground we call camp. 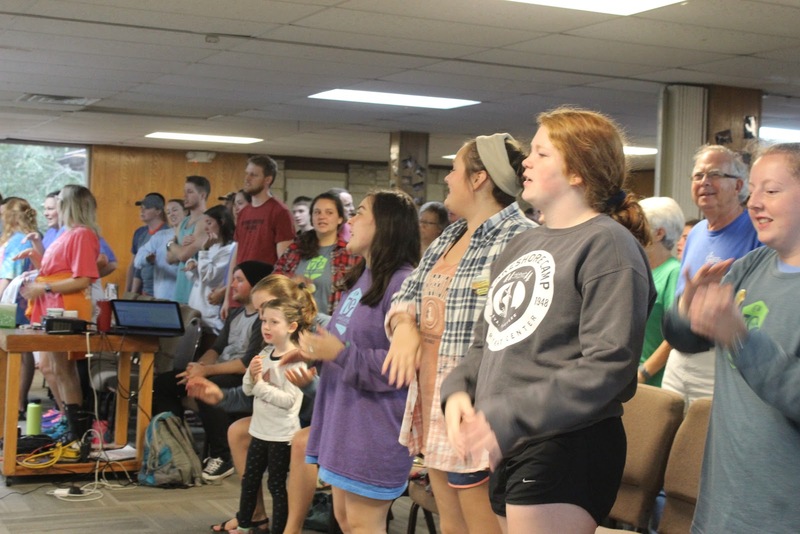 We worshiped, praised, and responded by writing why camp has been holy in our experience. Saturday was full of activities–crafts, music jam, reminiscing, swimming, playing in the Outdoor Classroom, and more. We honored guests by dedicating spaces at camp named after themselves or their loved ones. All together, we talked about the past, present and future of camp and what the next generation of Lakeshore may look like. We played a giant, intergenerational game of Color Cup. We sang, worshipped, and spent a lot of time catching up by the fire. Before we knew it, it was Sunday morning. Time for one last theme time, one last worship, one Sandy Feet reunion, a sharing of communion and a bittersweet farewell. We did make sure to capture photos of our staff from decades gone by. More than 100 former summer staff members attended the weekend. Several of them met their spouses here, received or affirmed calls to ministry here, and made lifelong best friends here. They have logged the hours together, and the love and understanding they have of one another was palpable. The people in this place, and the ones who couldn’t be with us, are truly part of a family. We are part of the Lakeshore family, but more importantly, God’s family–the family God created by making us His children through Jesus. As such, we are called to do his work when we leave this place, this Holy Ground. Over the weekend, we talked a lot about Holy Ground, about being rooted and connected, and also about the fruit we are called to bear. We loved having everyone here with us last week, but we love even more that we had a blessed weekend together to be nourished and filled, so that we may go and be about the Family Business once more. And until we meet again, Go with God. Previous Previous post: Virtual Color Cup Challenge!